Does education need a massive overhaul? Why have so many attempts to reform education failed? Is it even possible to transform a monolithic system that seems impervious to real change? Can we see the way forward? 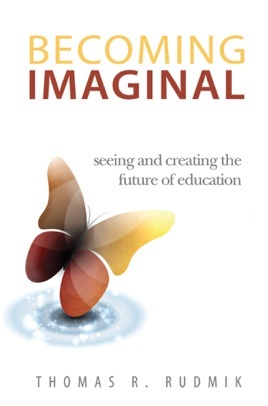 In Becoming Imaginal, educational visionary and reformer Tom Rudmik puts forth a unique and compelling vision for educational transformation in the 21st Century. 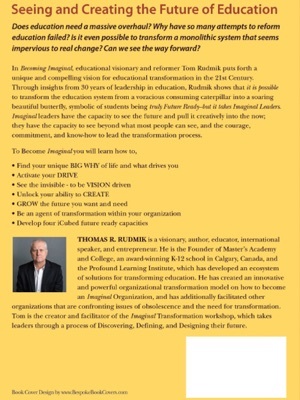 Through insights from 30 years of leadership in education, Rudmik shows that it is possible to transform the education system from a voracious consuming caterpillar into a soaring beautiful butterfly, symbolic of students being truly Future Ready--but it takes Imaginal Leaders. Imaginal leaders have the capacity to see the future and pull it creatively into the now; they have the capacity to see beyond what most people can see, and the courage, commitment, and know-how to lead the transformation process.